I’m in a Sichuan cooking kick. I got some great authentic ingredients on The Mala Project (awesome site, awesome store!) and have been trying things ever since. 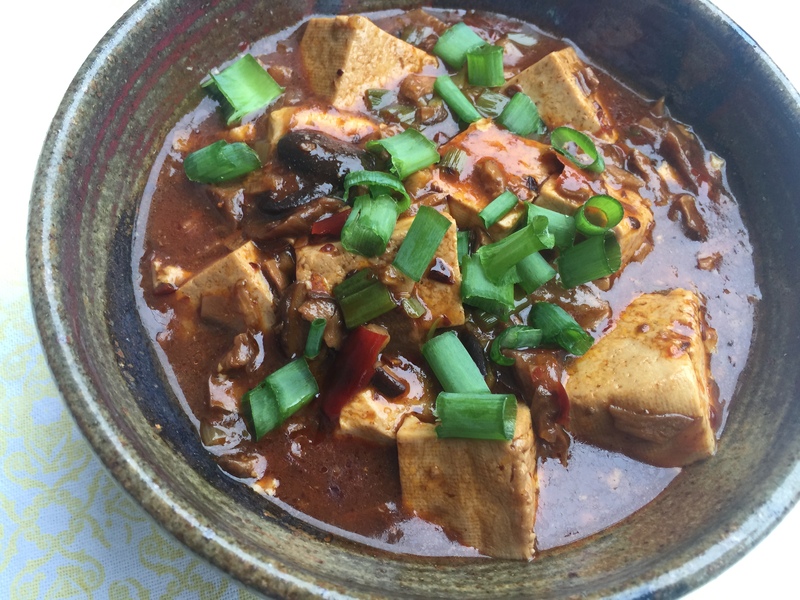 This recipe for mapu tofu uses mushrooms for the “meat”, just a little is all you need. I looked at different recipes and tried making it a few times and the recipe below was the end result. It is nice and spicy and mouth numbing. It is important to get good quality sichuan peppercorns. I had some before that just tasted bitter. The ones from The Mala Project are wonderfully mouth numbing and fresh! The broad bean paste I use (Pixian broad bean paste) doesn’t include soy beans like a lot of brands in the US. I haven’t eaten enough of both to absolutely know the difference, but this one is very yummy. The chili oil needs to be made ahead and I’ve included a delicious recipe link below. I make some in a mason jar and keep it in the fridge. We have successfully trained our toddler to enjoy spicy food. I don’t know if he just came into it on his own, or if by adding it little by little since 8 months did the trick, but he can dip his finger in sambel oelek and loves this mapu tofu. This is very helpful considering we eat lots of spicy India and Asian food! Soak mushrooms in boiling water until soft. Chop the mushrooms but save the water (good broth!). Heat chili oil in a saute pan (LOVE THIS PAN! ), add the broad bean paste, garlic, ginger and white part of the green onions and cook until everything is a little toasty. Add the mushroom broth, tofu and sichuan peppercorns. Bring to a boil. In a little bowl mix cornstarch and water, then pour into the dish and stir. Serve with rice and top with the green parts of the green onions.